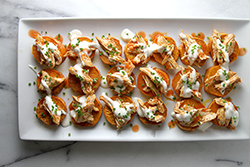 These buffalo chicken sweet potato bites are a total crowd pleaser. 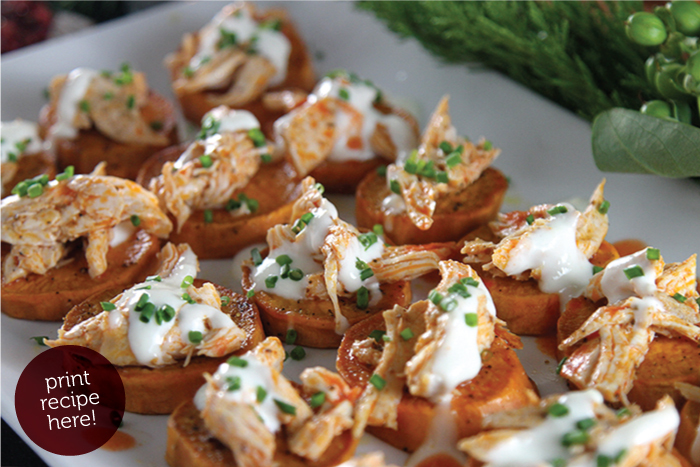 The kick of spicy buffalo sauce and the cool blue cheese dressing are heaped on a slice of roasted sweet potato in a tasty, tasty appetizer. Double this recipe -- they're that good! 2. 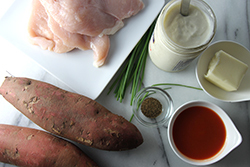 Prepare the buffalo sauce by melting the butter and mixing it with the hot sauce and celery seeds. 3. 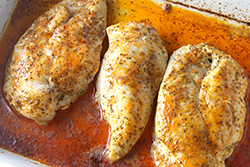 Salt and pepper both sides of the chicken breasts, then smother them with the sauce and bake, uncovered at 400°F for 10-15 minutes or until chicken reaches an internal temperature of 165°F. 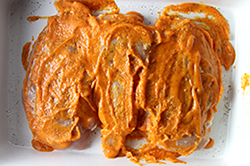 Remove from oven, and with two forks shred the meat apart. 4. 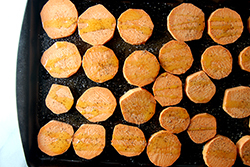 Meanwhile, slice the sweet potatoes into 1/4-inch rounds, and place in a single layer on a nonstick baking sheet or one lined with parchment paper. Drizzle with olive oil and sprinkle with salt and pepper. Roast in the oven at 400°F until tender to the tip of a knife, about 9-12 minutes. 5. 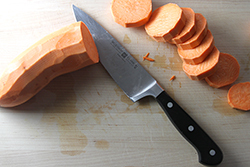 Assemble the bites by layering shredded chicken on top of each roasted sweet potato slice. Drizzle with the blue cheese dressing and sprinkle the top with chopped chives.